In the early 1950’s, several families in the Thalia Community attended services held at Scott Memorial Methodist Church in Oceana. Realizing the need for a new church in the fast growing Thalia community, a small group began meeting in one of the homes each Sunday. 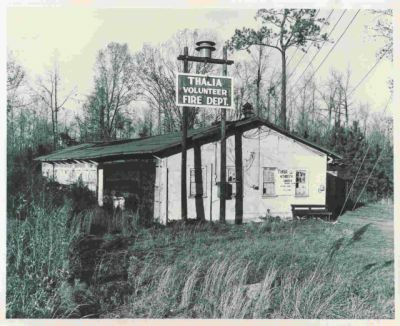 On January the 18th, in 1953 at precisely 3:00 P.M., the Thalia Methodist Church School was born, and met in the old Thalia Civic Club (better known as the old fire house). We had an assortment of mismatched chairs, a piano, a pulpit a nd a pot-bellied stove to keep us warm. On March 29, 1953, Thalia Church was organized with thirty-three charter members. Through many difficulties and trials, the membership of both Sunday school and Church grew under the leadership of our Supply Minister Mr. E.E. Cox, who was a public school teacher. A building fund was set up in 1954. The sum of $5,999 was raised by August 21, 1955 and plans for building a permanent church proceeded. The Thalia Methodist Church cornerstone was laid during services, and on Sunday night, October the second, the Church’s first revival took place. In this busy year, more than one hundred new members joined the congregation. By this time, the church was in need of a full-time pastor and on June 16th, 1957, Mr. Cox preached his last sermon. Bill Asher took over and Thalia Methodist was well on its way. As membership continued to grow, plans for an education building were made. In 1960, classes first met in the new education building and the new sanctuary was completed. Many additional improvements were soon under way. In 1967, a newer, and bigger educational building was completed – and in January of 1970, a new sanctuary was consecrated (it is the one we enjoy today). Throughout its over 60 years, Thalia United Methodist Church has provided opportunities for worship, spiritual growth and service. We have built a strong foundation on which we continue to build into the future.